In one of our essays (1), we have highlighted the double meaning of the expression "to be like the Fool in tarot cards", that is to say, "to be of no value", albeit a card considered of great importance in the game. In fact, the Fool - remembering that the tarot was designed as a pack of playing cards - had no power to capture the other Triumphs (Major Arcana), as Girolamo Zorli, a major historian of card games, points out in his part of our article (2). On the other hand, the expression could point out that the Fool, even though he had no power to capture, could at the same time not be captured by the other cards. It was, in short, a key element. In that sense, widening the concept, 'to be like the Fool of the tarot' could mean being someone you could not do without. The expression, however, was typically used in common talk with the meaning of “no value” or “something extraneous” that had nothing to do with certain situations or people. 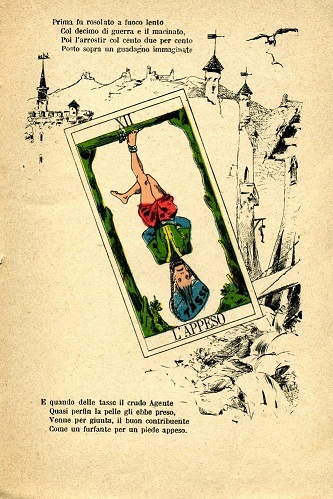 Since Carducci in his work refers, about Italy, to the expression “essere in Europa quello che è il matto nel giuoco de’ tarocchi” ("being in Europe what the Fool is in the game of tarot"), we find it of interest to undertake a review, considering the fact that the passage was written at a time of Italian political and social history that can be compared to the present situation. His collection of poems Giambi ed Epodi [Iambs and Epodes], published in 1882, shows itself as a controversial work, as is already evident from the prologue. He intends to condemn the evils of his time, “the bad era”, in the name of betrayed youthful dreams and Freedom yet to be fully attained. Da rivolare a gli sperati amor? That fill my soul with sorrow. Your calls, O Glory, O Freedom. At midday I tromp on them. To crown you with immortality. I want to send my blazing heart. In his work Carducci, in addition to extolling the great ideals of freedom, justice and despising the compromises of a united Italy, makes himself the palace paladin towards the Papacy and its ally, France, who have betrayed the values of Freedom gained through the Revolution. Cittadino Mastai (1), bevi un bicchier! (What do I care about priests and tyrants? They are older than their old gods. Today, with the pope, I will conciliate. [Of] a desperate will to love! So beautiful in the mirror of the Adriatic Sea. (1) Giovanni Maria Mastai Ferretti (Pius IX), who was born in the city of Senigallia. Noi che t’amammo, o Francia? Just as the storm destroys the flowers. As brigands for the Pope. Their wives the desire to live. We who loved you?) (5). At this point, to enter the heart of our argument, we need to highlight Carducci's position and thought on Italy of the time. The poet wrote the Giambi ed Epodi between 1867 and 1872, the period in which Jacobin ideas were welcomed by the poet, tending to support the nascent republican governments and Italian monarchical power that he felt to be the guarantor of popular liberties. Carducci was convinced that Italy would be able to unify without the help and intervention of foreign powers: the lords and citizens, the army and the people, the monarchy and the democratic factions would have united under such an aspiration. Carducci was ashamed, as we have seen, by the French presence, the bad government in the South, the arrest of Garibaldi in Aspromonte and the defeats of Custoza and Lissa. All this had helped him to condemn the politics of the moderates. “E in quell’anno  l’Italia ebbe inoculato il disonore: cioè la diffidenza e il disprezzo fremente di se stessa, il discredito e il disprezzo sogghignante delle altre nazioni. Sono acerbe parole quelle che io scrivo, lo so. Ma anche so che per un popolo che ha nome dall’Italia non è vita l’esser materialmente raccolto e su’ l rifarsi economicamente, e non avere né un’idea, né un valore politico, non rappresentare nulla, non contar nulla, essere in Europa quello che è il matto nel giuoco de’ tarocchi: peggio, essere un mendicante, non più fantastico né pittoresco, che di quando in quando sporge una nota diplomatica ai passanti sul mercato politico, e quelli ridono: essere un cameriere che chiede la mancia a quelli che si levano satolli dal famoso banchetto delle nazioni, e quasi sempre, con la scusa del mal garbo, la mancia gli è scontata in ischiaffi. Quando sarà promosso a sensale o mezzano? La gloria delle storiche città è sostenuta dai ciceroni e da gente di peggior conio. Le più belle fra esse sospirano al titolo e alla fama di locande e di postriboli dell’Europa. E la plebe contadina e cafona muore di fame, o imbestia di pellagra o di superstizione, o emigra. Oh menatela almeno a morire di gloria contro i cannoni dell’Austria o della Francia o del diavolo che vi porti!”. (And in that year  Italy was inoculated with dishonor: that is, the mistrust and contempt of itself, discredit and contempt of other nations. These words that I write are dreary, I know. But I also know that for a people named by Italy it is not life to be physically harvested for making money economically, and to have neither an idea nor a political value, to represent nothing, to count for nothing, to be in Europe what the Fool is in the game of tarot: worse, being a beggar, no more fantastic or picturesque, than from time to time a diplomatic note goes to the passers-by on the political market, and they laugh: being a waiter asking for a tip from those who sat down to the famous banquet of nations, and almost always, with the apology of stomach-ache, the tip has taken him in the pits. When will he be promoted to intermediary or procurer? The glory of the historic cities is sustained by the tourist guides and people of the worst sort. The most beautiful of them sigh in their titles and fame at the inns and brothels of Europe. And the ignorant country folk die of hunger, imported malaria or superstition, or they emigrate. Oh let him at least die of glory against the guns of Austria or France than of the devil you bring!) (6). 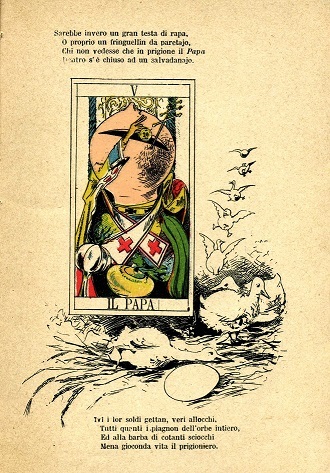 The Bagatello[Magician]was associated with Agostino Depretis, Prime Minister at the time; The lines accompanying the card of the Pope (Leo XIII) appear like a heavy accusation of radical mold to the Vatican's wealth; the card of the Emperor criticizes Paschal Mancini, Foreign Minister, rewarding Italian reintegration to Austria and Germany; the Hanged Man becomes the good taxpayer, especially those of the tithe of war and the grinding of grain. 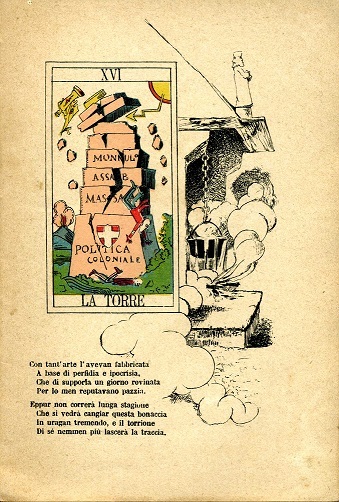 Particularly expressive are the verses accompanying the Tower card against the colonial policy of the government, which occupied the Bay of Assab in 1870 and that of Massawa in 1885. Prophetic verses, we would dare to say, as they anticipated the defeat of Italian ambitions in Eritrea, which happened just a year later at Dogali on January 25, 1887. Below, the verses and illustrations relating to the Tower, the Pope and the Hanged Man. To say the least was reputed madness. Of itself will leave no trace. Is enclosed in a piggy bank. The prisoner leads a carefree life. Like a rogue hanging by one foot. 2 - See the essay From ‘Barocchi’ to ‘Tarocchi’. 3 - Giosuè Carducci, Giambi ed Epodi, Prologo [Ambics and Epodes, Prologue], vv. 19-34. 4 - Ibid, “Il Canto dell’Amore” [The Song of Love], vv. 109-120. 6 - Giosuè Carducci, “Confessioni e Battaglie, Serie Terza” [Confessions and Battles, Third Series], Giampi ed Epodi, Rome, Publishing house A. Sammaruga, 1884.